Welcome to the Aura Cozumel Grand Resort, an All Inclusive adults only resort in Cozumel. Aura is more than a place to unwind, it’s a unique concept created to deliver a superior standard of service, accommodation, cuisine and entertainment. The foundation of our philosophy is based on creating a unique contemporary environment that caters to guests seeking the ultimate vacation escape. Welcome to the Aura Cozumel Grand Resort, an All Inclusive adults only resort in Cozumel, Mexico. Aura is more than a place to unwind, it’s a unique concept created to deliver a superior standard of service, accommodation, cuisine and entertainment. The foundation of our philosophy is based on creating a unique contemporary environment that caters to guests seeking the ultimate vacation escape. This Cozumel hotel is situated ideally for business or pleasure. Guests of the hotel will be able to enjoy a range of nearby activities, including scuba diving, snorkeling, golfing and touring the Mayan ruins. 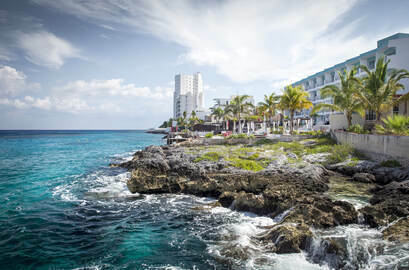 A variety of restaurants, shops and nightclubs are located in the area near the Aura Cozumel Resort Wyndham Grand Bay. Cozumel airport is located just a short distance from the Aura Cozumel Resort Wyndham Grand Bay. Public transportation is available in the area, including taxi service. Guests may also take advantage of the opportunity to rent a car in the local area as well, if they wish to explore independently. Parking is available at the hotel. Guestrooms. The hotel’s different guestroom categories welcome you with a warm and inviting blend of light, space, comfort and functionality. Classic avant-garde style decor combined with a creative use of wood, stone, marble and tapestry ensures that Aura Cozumel Grand Resort’s 87 stunning suites harmonize with the local surroundings. All suites feature a private balcony offering magnificent ocean views, flat screen high definition TV, wireless high-speed internet access, iPod docking station with a radio alarm clock, electronic laptop-sized safe deposit box, 300 thread Egyptian cotton bed linen and Comfortline king and queen sizes beds. FREE HONEYMOONERS PACKAGE: King size bed, 1 bottle of domestic wine, Please request your honeymoon package at time of booking. Wedding certificate or proof of marriage could be requested at time of check in. Hava Grill reaffirms the concept of Aura Cozumel Grand Resort, where we put our energies into your utmost rest and relaxation, whilst simultaneously dazzling the finest of palates. Throughout the day you can enjoy our truly delicious seafood cocktails, freshly made pizza and light Mexican-Caribbean delicacies. In the evening you can find a select variety of fine grilled cuts of fresh meat, fish and seafood. Over the delicious a la carte breakfast you can choose from the freshest ingredients, made to order omelets, Mexican style eggs, a grand variety of natural fruits and freshly prepared juices. Isola dress code: smart-casual, no flip-flops. In the south of Cozumel Island and 15 minutes from the downtown area, Aura Cozumel Grand Resort is close to shops, reefs, archaeological sites and the Chankanaab National Park Nature Reserve. The Cozumel Country Club Golf Course and the local airport are about 30 minutes from the property.